Ashley Fiolek is the type of chick that leaves boys in the dust, literally. And if they scream at her to “come back!” she won’t hear them. And it’s not her Honda’s 249 cubic-centimeter four-stroke engine’s growl that’ll drown out the sound. Fiolek, a 20-year-old professional motocross racer from St. Augustine, Fla., has been profoundly deaf since birth. In a sport dominated by both sound and men, Fiolek is causing a ruckus in the world of motocross. 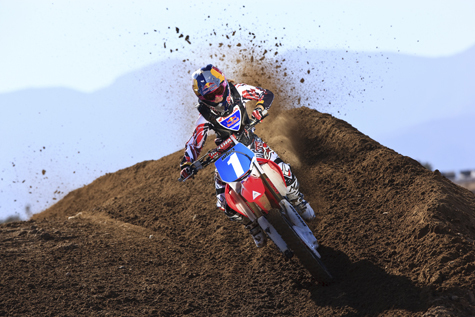 In 2008 Fiolek dethroned five-time Women’s Motocross Association champion Jessica Patterson and became the youngest WMA champion ever. 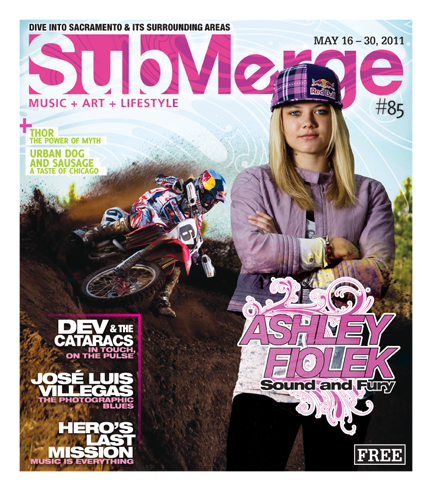 She has two X Games gold medals under her belt as well as a second WMA championship, was the first female in action ever to grace the cover of Transworld Motocross, the first ever female appointed to the factory Honda Red Bull Racing team and most recently Fiolek was featured as the central figure in a “World of Red Bull” TV commercial that is getting major primetime airplay. The epic minute-long commercial, shot at the picturesque Zaca Station motocross track in Buellton, Calif., features dramatic Indiana Jones-style music, fly-by helicopter shots, crazy 3-D POV camera technology, and of course, Fiolek ripping through the track like a true savage. The only catch, you don’t know it’s a girl the whole time. At the very end of the commercial, Fiolek pulls up to the camera, takes off her helmet revealing her long blond hair and says in American Sign Language, “Welcome to my world. The world of Red Bull.” Imagine millions of viewers’ jaws dropping when they realize that the mystery rider in the commercial is in fact a cute, young, deaf woman. Fiolek has never been one to let her disability get in her way and she even goes as far as to say that it’s harder being a female in motocross than it is being deaf in motocross. “Most people have accepted my deafness pretty easily,” Fiolek told Submerge in a recent e-mail interview. “I have been riding and racing for a long time and people are just used to me being around. You can catch Fiolek and other top motocross riders, in action right in our own back yard on Saturday, May 21, 2011 at the 43rd Annual Hangtown Motocross Classic in Rancho Cordova. Read on to learn more about this fascinating and inspiring young athlete. I normally head out to California to train but right now I have stayed at home in Florida. We have had very good weather and no rain so it has been good! I have just been riding and training and hanging out with my friends. 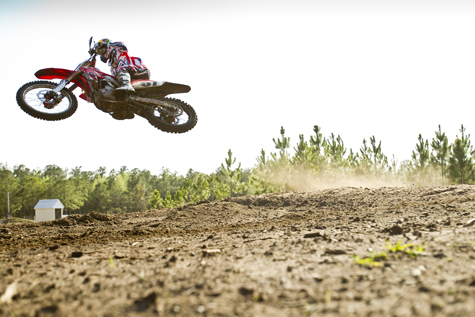 What have you been doing to get ready for the upcoming motocross season? What is your training regimen like both on and off the bike? I normally take some time off then I start back up riding and training at the New Year. I ride as much as I can during the week, and then I do a cardio and strength training program for off the bike stuff. Last year you finished second overall and in truly dramatic fashion. It came down to the very end between you and your “rival” Jessica Patterson. Was that a tough loss for you? Has it motivated you to work harder to re-claim your throne this year? Yes, it is always hard to lose! Anyone that is competitive knows that. I have definitely been motivated this year, and I hope it all pays off. How important is winning to you? Is it everything, or is it just one thing? It’s everything! Well it is pretty important. No one likes to lose. I’ve heard you say in past interviews that you “live and breathe motocross.” Can you imagine what your life would be like without it? Where do you think you’d be today if you never started riding? Wow, I am not sure what I would do if I wasn’t riding, but it would definitely be some kind of sport! I am not one to just sit around and do nothing; I like to be active and moving. I’ve seen the footage of when you fell and injured your collarbone in a Sept. 5, 2009 race. I was amazed how fast you popped right up and got on your bike despite having just fallen so hard. That shows a lot about your character. Is falling something you think about often while riding? It seems like it would be hard not to. Well, of course you don’t want to fall! It is part of our sport not if you get hurt but when. When I am out riding I really don’t think about it and hopefully it won’t happen! During that race, I knew I had to finish 11th place or better for the championship, so knowing that and with my adrenaline pumping I just kept going. You’ve received some major press over the past couple of years and have become the face of women’s motocross, if not motocross in general. Seeing as how you are a huge figure and role model in your sport, do you ever feel pressured or stressed out? Well sometimes I do feel pressure. I am only 20 and it is a lot to think about! I just always try to do my best and be the best role model I can be. I want our sport to grow so whatever it takes to get women’s motocross out there is good for me. I want to talk a bit about the new World of Red Bull commercial. It’s an incredible ad and I’ve seen it on television a number of times in the past few weeks. How does it feel knowing that literally millions of people are going to see that? That’s got to be a gnarly feeling! Oh yes. It is incredible! I didn’t really realize how many people would see it or how far it would reach, but the response has been crazy. It is strange to know that so many people are seeing it. My mom was watching cartoons on the FOX network the other day with my brother and it came on. Go Red Bull! How shocked do you think most people are at the very end of the commercial when you take your helmet off and they see that A) you are a girl, and that B) you’re deaf? I bet the look on most people’s face is priceless. I hope people are shocked. For me and my family it is hard to watch the commercial thinking I am a guy, because we know it is me. Some people that I know, that didn’t know about the commercial, were shocked. They didn’t realize that it was me until the end! I am sure most people that are not into motocross are probably more shocked that I am signing at the end. What are your techniques to make sure you get in front, and stay in front, of other racers? How does being deaf play into these techniques? What sort of signals or indicators are you looking for when you’re riding? Well you have to try and get the “holeshot,” this is to be the first one to the first turn. It is hard to be out in front but you have a clear view of the track so that is good. If I get the holeshot, I just try and push myself hard and stay in front. My mechanic will give me info on the pit board when I come around to the mechanics area so I know where the next rider is at. Switching gears a bit. Tell me about your book that was released last year, Kicking Up Dirt. What inspired you to want to write a book? Well I hadn’t really thought about it much, but a woman that interviewed me one time for a magazine wanted to write a book with me about my life. She approached me and we started working on it together, and my mom and dad helped too with some early on info from my life. Is writing something that you particularly enjoy? What are some of your other hobbies? When you have free time (if any), what do you do for fun? It was a lot harder to write a book than I thought! It was a lot of research and a lot of interviews. It took over a year to do and it was pretty intense, but I am glad that it happened; in the end I really liked the book! In my free time I like to Jet Ski and snowboard or ride pole position cars, anything crazy. Any final shout-outs you’d like to give? Well I would definitely like to thank my sponsors who have stuck behind me all these years. Alpinestars, Red Bull, Honda, Leatt, they have been with me almost since the beginning of my pro career. Alpinestars and Red Bull were with me in my amateur career! My mom and dad have been great, they have helped me with everything and are always there for me. I wouldn’t have made it this far without them for sure! God is definitely looking over me.